Your Joe is awesome - just like I like mine, black and sweet! Sweet finish, Thelma! Of course, Cooper, could be upstaging you, he's pretty darn cute also!! I don't usually like black back grounds, but, this really looks nice! Good job! How I love the way you take one of these already nice patterns and make it your own spectacular version! Well done! Good morning!!! I love your latest finish!!! Stars, stars, stars!! Nothing could be better!! I have just ordered a jelly roll of Potluck - so nice to see a finish - love it!! I so admire how you work on one project at a time. You are my idol!! Dogs are wonderful, aren't they? The quilt is lovely, too! I love your version of "Morning Joe" and I love dogs too :) There is nothing better than the undconditional love of a pet :) What kind of dog is Cooper? Your pup is too cute....oh and the quilt is beautiful too!!! Thelma your quilt is absolutely gorgeous!! First, the quilt looks great! Second, Cooper's coat matches the carpet so it looked like his head was cut off and on a white counter at first glance! I was trying to figure out how you did that. HA! The quilt is remarkable. Very stunning. And Happy Birthday to Cooper!! Trick or Treat! Cooper's picture made me laugh! I am making this quilt with black but I think I will "scrap it" or "stash it" for the brights. I have plenty of scraps hanging around. It. Is. AWESOME! Happy Halloween to you and the adorable Cooper! What a fantastic finish! Great colour work on this! I really like the black background with the fabric you used. Both Morning Joe and Alternate Joe are on my to-do list - I love star blocks! I can not decide which I love more.....Cooper in his costume or the quilt top. One is just adorable and the other is so bright and cheery. Happy Halloween Thelma! Love, love, love your quilt!! That's gorgeous, Thelma. Great job! Love your Morning Joe Alternate! Love those bright fabrics with the black backgrounds. Well done! 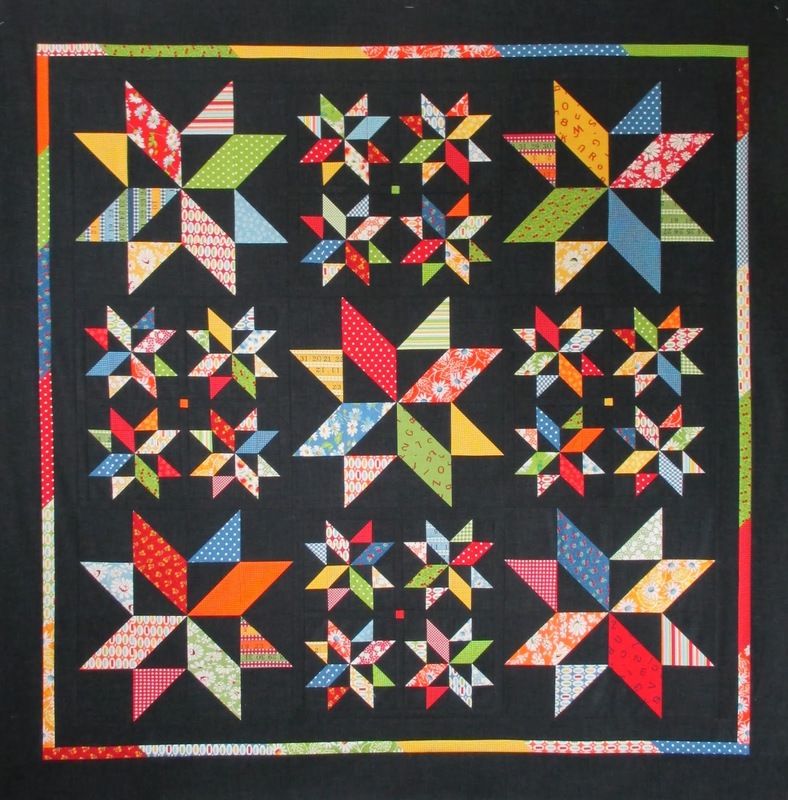 There are a lot of pieces in that little quilt and it sure is cheerful looking! Using black for the background was an inspired choice. I love it! I have never followed a formal pattern before, but I think this might just be a first. It truly is a beautiful quilt. love the photo of your dog! You simply keep me in awe. I cannot believe how quickly you put a quilt together! I'd probably still be cutting out fabric. This quilt is wonderful! I have enjoyed watching you make this quilt and it is just gorgeous! The black background is so perfect. I think one would look great hanging in the nursery for my new granddaughter that is to be born in December. Thanks so much for sharing it!